Just in the last two decades, photography technology has done some incredibly interesting things to cameras. About twenty five years ago, all cameras were film based. They had to be manually loaded with the film. And, they were bulky in size. This is definitely no longer the case. Today, you can have a slim digital camera that can be found in all colors, shapes, and sizes. And, when I say sizes, I mean from small to smaller. As electronics become more and more sophisticated, they also become smaller and thinner to fit the demands of the marketplace. Small digital cameras have found a very welcome consumer base that is able to feed the appetites of compulsive picture takers. Now you can find mini digital cameras small enough to easily slip in your pocket and you can have it with you 24 hours a day. There is never a reason to miss a photo again. And even if you’ve got the latest and best 35mm DSLR with all the lenses and accessories you can’t have it with you all the time. Consider one of these tiny digital cameras to add to your gear and you’ve really got the perfect ‘walk around’ camera. Super small size – Their size is so small James Bond would be jealous, allowing them to be carried virtually anywhere with very little effort. High Quality Photos – They have enough mega pixels for you to take any picture and blow it up to almost any size. 10 MP and 12 MP models are available and affordable. Trendy and Stylish – Yes, they have the tendency to be very trendy and very stylish making them appeal to pretty much everybody. And there is nothing wrong with that, is there? With top rated company brands like Casio, Canon, Nikon, Pentax, Samsung, Panasonic, Kodak, Sony, Fuji, and Olympus marketing their own unique models of slim digital cameras, the variety of available features and styles are almost endless. Another one of the exciting benefits of owning one of the many slim digital cameras that are available on the market today it that they really do not require any excessive level of specialized training to operate them like those film based cameras of yesteryear did. Today, almost anyone can pick up a slim digital camera and just take several minutes to familiarize themselves with it before going out and shooting some great pictures pretty much effortlessly. You can find high quality cameras today that will easily fit in your shirt pocket or will hardly take up any room in your purse or handbag. 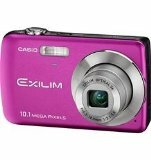 One very popular model is the Casio Exilim EX-S12 12MP Digital Camera pictured to the left (click on the picture or this link to check it out at Amazon). This camera is very small but it is a powerhouse for it’s size. It is smaller than a package of cigarettes measuring 3.7 inches wide by 2.2 inches high by 0.6 inches deep. It features 3x Optical Zoom and has a 2.7 inch LCD screen. 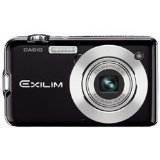 If you want a camera that you can always have with you that takes great high quality shots then the Exilim EX-S12 is a great choice. Then throw in the fact that you can also record HD Video clips that you can upload right to YouTube if you want and you’ve got the perfect carry everyday camera! And if you want to save a little money and still get a perfect slim digital camera that you’ll always have at your fingertips, you should check out the Casio EX-Z33VP 10.1MP Digital Camera with 3x Optical Zoom and 2.5 inch LCD (Vibrant Pink) pictured above at the right. This camera looks great in pink, but also comes in black and a pale blue. Today it is so easy to have a camera that takes great pictures with you at all times. You never need to miss a chance to snap a memory that you might cherish forever. Check out the various slim digital cameras and get yourself one today.